With each passing year, the allergy season predictions tend to get worse and worse. To the dismay of many allergy-sufferers, these predictions are almost always accurate. Each year, the pollen count seems to get higher and higher--something many forecasters believe climate change is responsible for. On average, the start of springtime allergies affects 50 million Americans and each year, the start of allergy season always brings with it a new batch of myths about its causes and treatments. Although there’s a plethora of information from doctors and researchers about the origins, causes, and treatments of seasonal allergies, the general public seems to stick to their allergy myths. With that being said, let’s dive into common allergy myths. Although there are a few instances where certain bacteria, viruses, diseases etc., become immune to certain medications when taken in excess, this is not the case for allergy medication. Many studies have debunked this myth time and time again, yet it still remains one of the top allergy myths. Whether you take prescription antihistamines or over-the-counter nasal sprays, your body will not become tolerant of these allergy medications. Due to the media’s depiction of allergy season--the onslaught of pictures and commercials of people sneezing and coughing near the vicinity of flowers--many tend to associate allergy season with the blooming of spring flowers. However, this is the exact opposite. 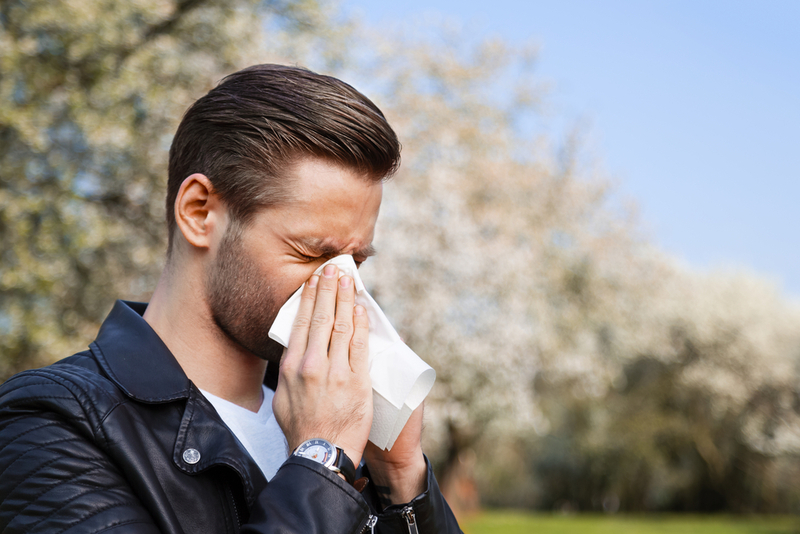 Springtime allergies are actually caused by the spread of tree pollen--the most potent being oak, birch, and maple. Trees that produce flowers such as dogwoods and cherry blossom trees and flowering bushes tend to attract insects for pollination. This means that the pollen they produce is rarely airborne and doesn’t contribute to allergies. This year in the US, we experienced just that: a long, cold winter and a late spring. However, just because we experienced a later spring, doesn’t mean that allergy season will be any less potent than the last. In fact, rising temperatures and longer days with ample sunlight will actually commence pollination. Due to this, many cities across the US already started seeing a high pollen count starting in February and March. There are even studies that show an early and heightened plant growth and pollination season as a result of warmer temperatures and higher CO2 levels (source). This is actually the exact opposite; those who only seek treatment for their allergies once they see large amounts of pollens everywhere have a harder time soothing their allergies. As the temperatures start to transition from cold to warm, we are exposed to trace amounts of pollen which are enough to trigger mild allergy symptoms. Allergies will always be a problem before the spread of large amounts of pollen. Many allergists recommend to their patients to schedule an appointment and start treatment at least 2 weeks before allergy season starts. The internet is the main reason this myth has spread due to the many sites and articles that state honey as an allergy soother. Although honey is tasty and boasts a variety of anti-inflammatory and antimicrobial properties, the idea that it works effectively to prevent allergies is a complete myth. In fact, this myth was originally debunked way back in 2002. In 2002, the Annals of Allergy, Asthma, and Immunology studied three groups of allergy-sufferers during the spring season. One of the groups was instructed to eat a tablespoon of locally sourced honey each day, another group ate commercial honey, and the last group was given corn syrup (placebo). When recording the results, researchers saw no difference in the allergy benefits of honey over the placebo. You don't have to suffer every allergy season. Contact us to schedule an appointment with one of our experienced allergies.